One of the best features of Events Calendar PRO is Photo View. While Week View or Month View are best at communicating the time of the event and Map View emphasizes the location of the event, Photo View does a fantastic job of emphasizing the content of the event, bringing it to life and creating a great user experience. Some folks, though, are not taking advantage of Photo View on their calendars. So we’d thought we take this opportunity to share with you why Photo View adds value to your calendar and how to use Photo View to your advantage! People Like Pictures, It’s A Scientific Fact. Think about how often people are taking and sharing photos today. We’ve got incredible cameras built into our phones with numerous ways to share them with the people we care about. It really is true that pictures are worth 1,000 words, they carry so much information and meaning. Using Photo View on your calendar harnesses the power of communication that photos possess, allowing you to share information in a beautiful and meaningful way. People are able to scan images much faster than text. By using Photo View your users will be able to scan your many events and quickly find the ones they are looking for. It’s this sort of simple feature that can greatly increase user experience on your website. Images breathe life into websites and even more so into calendars. 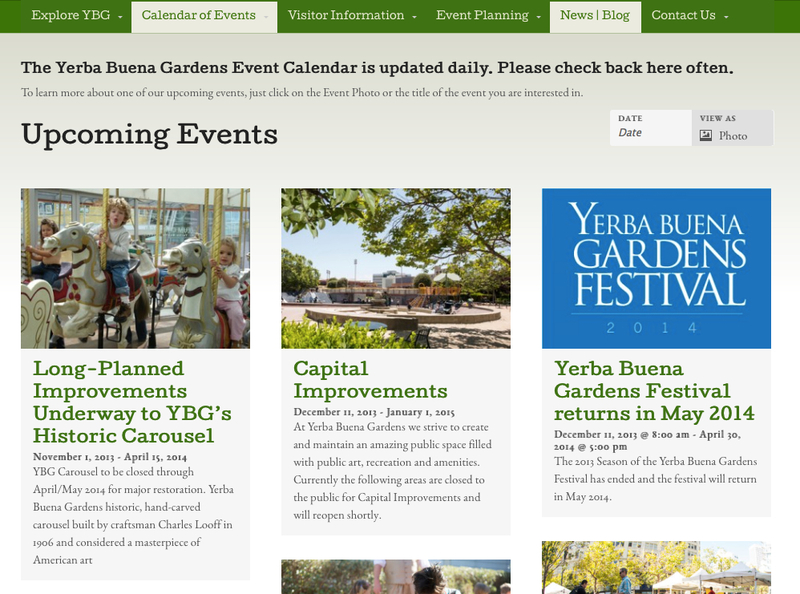 Take a look at the Yerba Buena Gardens calendar below. The photos offer a glimpse into the event itself, share a story, and offer some variety to an otherwise straightforward list of events. This seems like a no brainer, but trust me sometimes people don’t do this. The purpose of Photo View is to communicate more about your event than what is in the event details. Which leads us to the next point. Events calendar PRO is essentially a marketing tool for your events…so treat the photos you use on your calendar as such! Use photos that are going to communicate the atmosphere and culture of an event. Photos of people participating in previous editions of the event are great as well. Make sure the photos you use look good! By ‘look good’ I mean: in focus and not pixelated. Pixelation occurs when a small photo is blown up to a larger size. Photos taken on your phone should be good enough, just make sure they meet the pixel size requirements for images on your specific WordPress theme. Seriously, use your own photos or pay someone to take them for you. Don’t steal someone else’s work. Not only is stealing lame but you can get in some serious hot water if, and when, you get caught. Simple Text Graphics Work Too!! If you don’t have photos from previous editions of an event and you don’t want to pay for a stock image, you can always use a text graphic instead. These can be done easily in Photoshop or other programs. Just be sure to keep these simple, less is more here. Use an eye catching color, from your websites color pallete, and a legible font. You’ll want to make sure that all your photos and text graphics are uniform. You don’t want random colors sprinkled throughout your calendar, it’ll be distracting. For photos, try and stick to the same orientation, aspect ratio, and filters (if you choose to use these). Remember, your calendar is there to encourage people to come to your events, so making your calendar uniform and professional looking is of great importance! Only use photos and text graphics that are going to add to the clarity of the calendar and remove potential confusion. Keep it simple and you’ll be amazed at how great your calendar will look! At the end of the day it is your calendar, so have fun with it. We think that if you follow these suggestions you calendar will look great, but they’re just suggestions for you to consider and apply as you see fit. If you decide to take advantage of Photo View on your Events Calendar PRO we’d love to see it. Send us a link via Twitter to @TheEventsCal and we might add it to our Showcase! how did you get the photo view to display only a part of your event description? My one displays the entire event description. So how do I get a photo to show up in this view? Does the image need to be set as a featured image on the event? I did that but then the image in my event is full size! Please help. We’d be happy to help you get your Photo View and Featured Images configured to meet your needs. We handle all support via our forums- please post a thread in our Events Calendar PRO forum and a member of our support team will response shortly. Thanks for your support!